Did you know that you can cook spaghetti squash in the microwave? There’s no need to cut the squash, just pierce it a few times (to let steam escape), and microwave the squash whole for 10-15 minutes. Let rest, undisturbed, for another 10 minutes. It should then be soft, easy to cut through and ready to saute with garlic and chopped tomatoes. Finish off with minced fresh basil and a shower of grated parmesan cheese. 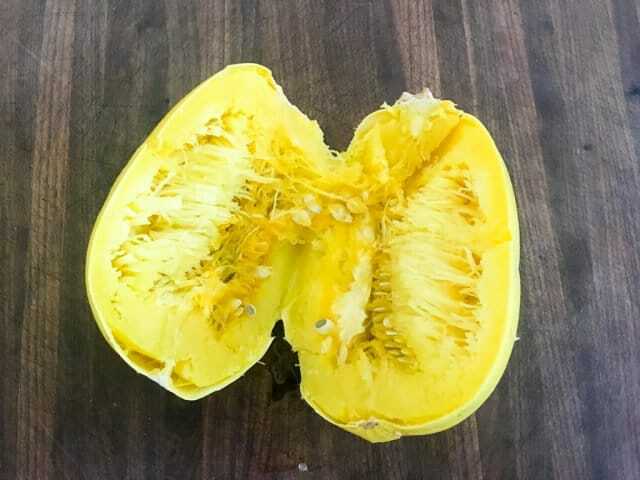 Due to a little goof while gardening with 35 seed packets and 2 over-zealous kids, we planted 12 spaghetti squash plants in the garden, enough to supply our entire zip code with spaghetti squash for life. Thankfully, our backyard chickens have a taste for the leaves and the happy-yellow flowers – and we haven’t stopped them from consuming most of the spaghetti squash plants, so now we’re left with 3 plants, one of which is barely hanging on. My hens are my heroes! With a harvest so large, we created different ways to enjoy spaghetti squash, and a shortcut for cooking…in the microwave, whole. 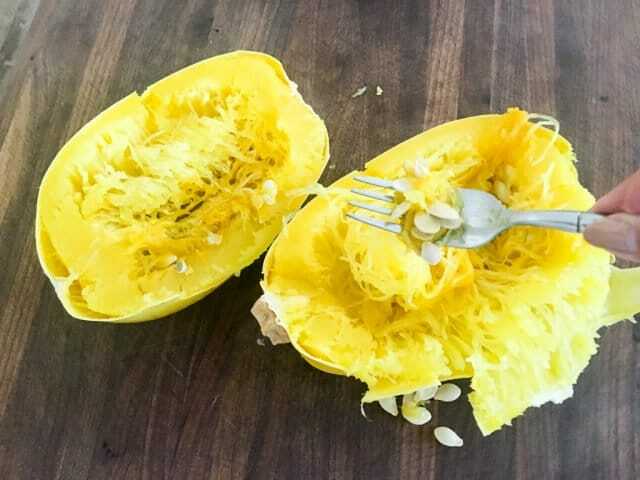 This recipe teaches you how to cook spaghetti squash in the microwave, whole. Once cooked, you’ll pull apart the strands of squash, saute with garlic, tomatoes, fresh basil and parmesan cheese. Why cook spaghetti squash in the microwave? Cutting an uncooked spaghetti squash is difficult! The skin is hard and thick. Plus, the squash is round, making it wobbly on a cutting board. Microwaving the squash whole eliminates the need for a hacksaw. 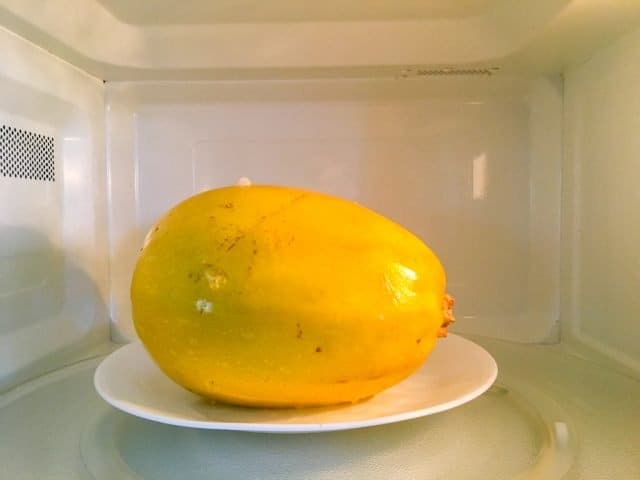 To cook spaghetti squash in the microwaving only takes 15 minutes. Baking in the oven takes 60 minutes (here’s how to bake the spaghetti squash in the oven, it’s just as easy, and you can bake it whole). Cooking the squash in the microwave saves energy, and leaves your oven free for other dishes. Take a sharp paring knife and carefully pierce the squash in several places all over. It’s a hard squash, so it takes a bit of effort to do this. 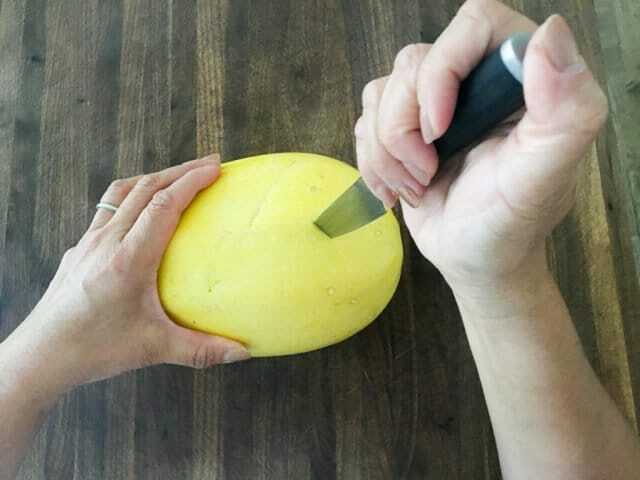 I guess a better instruction would be to say STAB the squash. 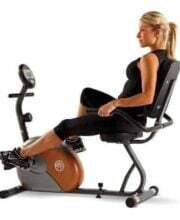 The squash is a round, rolly, hard object. These slashes will allow the steam to escape, so that it will cook evenly (and not burst in the microwave). Put the squash on a plate. Microwave on high for 10-15 minutes (depends on how big the squash is), rotating the squash halfway during cooking. 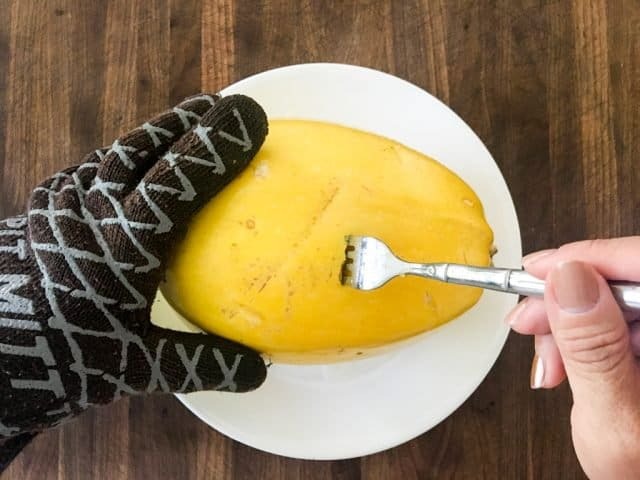 Put on some oven gloves and remove the hot squash. I highly suggest a thick towel or oven gloves – remember you stabbed the squash? The squash is steaming hot inside, and some of the liquid and steam may leak out through the stab marks. I use these Pit Mitts, which look a little funny, but they are amazing – soft gloves that actually fit my hand with rubber grippy grip lines all over. I highly recommend them as I’m not a fan of those traditional oven mitts that make you feel like you’re cooking with dinosaur hands. The squash should offer very little resistance when pierced with fork. If not, return it back to microwave and let it go for another couple of minutes. Remove the seeds with a fork. 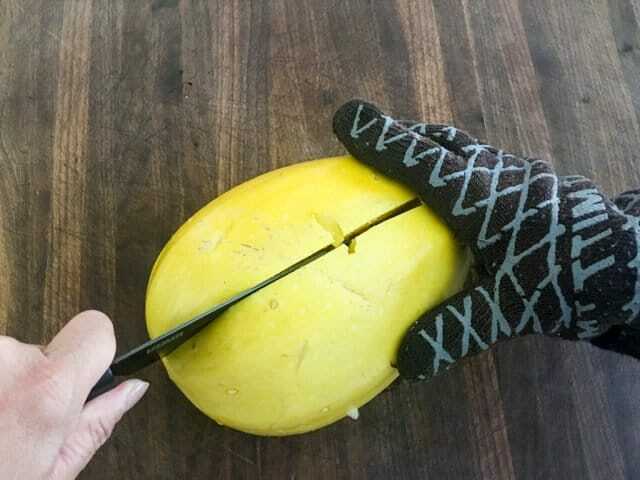 Use two fork to scrape out the strands of spaghetti squash. Try a piece of squash – if you feel like it needs to be cooked a little more, don’t worry – we’ll be sauteing in a pan and you can cook the squash further in the pan. 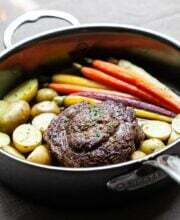 Just make a mental note that you’ll need to add a couple minutes of cooking time in the pan. 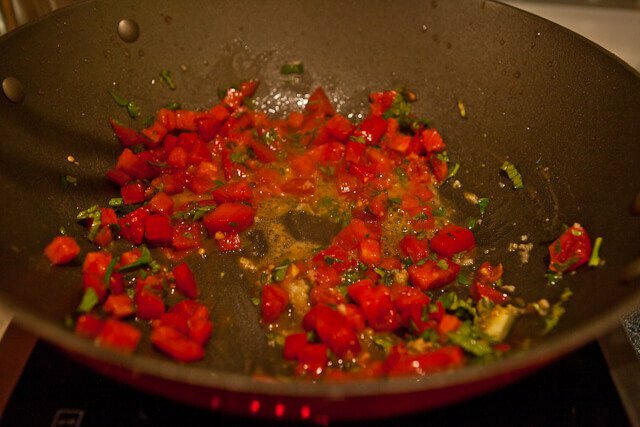 Okay, now it’s time to saute the rest of the ingredients – fresh basil, garlic and tomatoes. Add in the spaghetti squash, toss with tongs. Season with salt, pepper and balsamic vinegar. Throw in the cheese! Toss again. Will the squash explode in the microwave? Nope. Not if you stab it a few times all over. This allows the steam to escape. How will I know when the squash is done? You’ll know the squash is done cooking when you can easily pierce the squash with a fork with very little resistance. What do I do with the other half of the spaghetti squash? 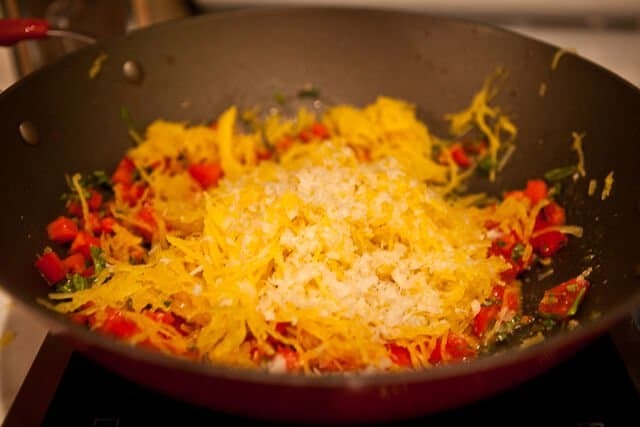 If you're only feeding 4-6 people, I suggest cooking the spaghetti squash whole, then only using half of the squash when you're ready to saute with the tomatoes. I like my spaghetti squash not too hard, not too soft. It shouldn't be mushy, you should be able to still separate the strands of squash. Plus, in this recipe, you'll saute the spaghetti squash for a few minutes, and it will soften in the pan. Using a sharp paring knife, carefully pierce (I really mean stab) the spaghetti squash in a few places (about 6 slashes is good). Place squash on plate. Microwave on high for 10-15 minutes, turning/rotating the squash halfway during cooking. I had a 3 1/4 pound spaghetti squash. 12 minutes total was perfect. The squash is done with a fork very easily pierces through the squash, if there is resistance - microwave for an additional 1-2 minutes. Carefully (the squash will be steaming hot! ), use a chef's knife to cut the squash in half, lengthwise. The squash should be soft and easy to cut. Remove and discard the seeds. 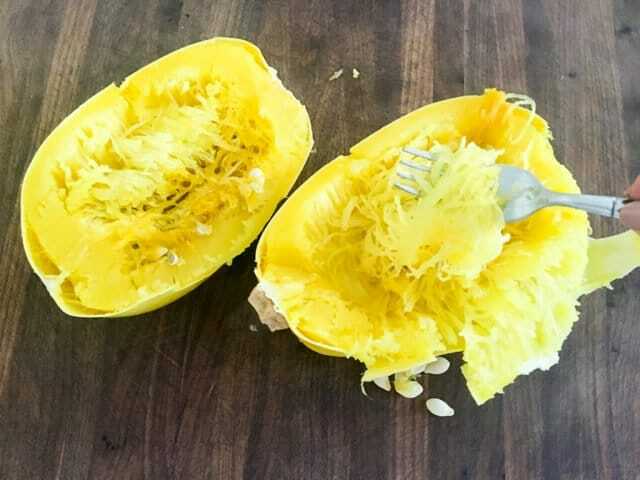 Use two forks to scrape apart the strands of the squash. For this recipe, we'll only use half of the spaghetti squash, about 4 cups. Heat a large saute pan over medium heat with the olive oil. Add in the garlic and cook for 1 minute. Add in the tomatoes and basil and cook for another minute. Turn heat to medium-high and add in the spaghetti squash and toss. Season with salt and pepper and drizzle in the balsamic vinegar. Taste the squash - adjust seasoning. If the squash still needs a bit more time to cook through, cover and cook for 2 minutes. If the squash texture is perfect, toss in the grated cheese and serve immediately. So simple! I love that I don’t have to cut the Spaghetti Squash before putting it in the microwave (like most other microwave recipes suggest). I just microwave it, scrape out the squash, and serve with butter alongside tomato sauce, sausage, and pasta spaghetti. Everyone at the table is happy. Thank you for sharing! OMG that squash looks so good! Thanks for the microwave instructions. I have never microwaved the spaghetti squash whole. I have always risked losing a hand cutting it in half. 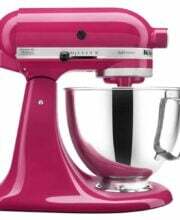 I can hardly wait to try this…Thanks Soo Much!! 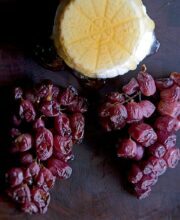 Great recipe and picture. 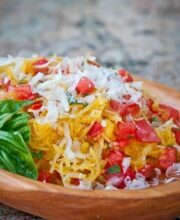 Love spaghetti squash and will make soon. Have the ingredients out of the garden. Thanks for sharing. Quick PSA: Do NOT microwave spaghetti squash! 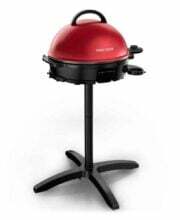 An experiences cook I know did properly vent it, however it exploded like a bomb when she went to touch it and she has second degree burns. Upon Google search, this is quite common. Just prepared my FIRST spaghetti in the microwave – thanks for this recipe!! I just made this. 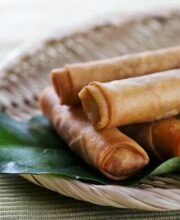 So quick and incredibly delicious! I’ll never prepare spaghetti squash any other way, ever again. Thank you. 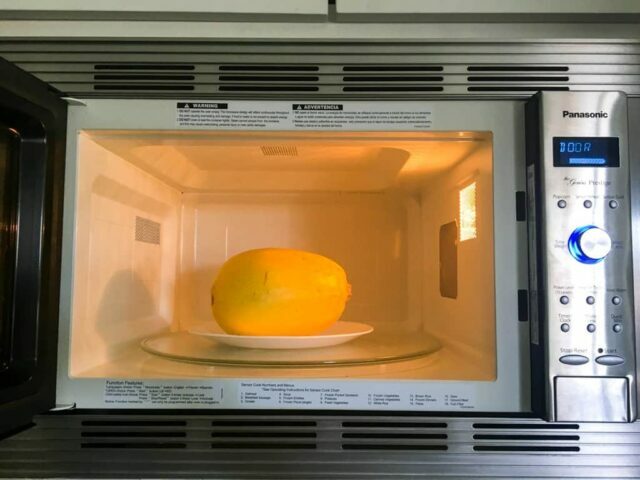 Be careful if you microwave the squash whole. I pierced mine, but apparently not enough, the whole thing exploded in the microwave and made a huge mess! 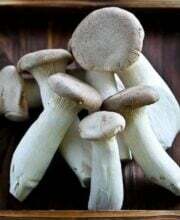 The texture and taste is much better if it is cut in half and roasted in a regular oven with a little olive oil and garlic. Beautiful photos, lovely presentation. 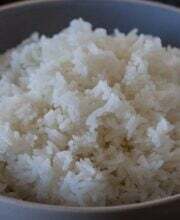 Your recipe is super easy and instructions are clear. Thanks for sharing. 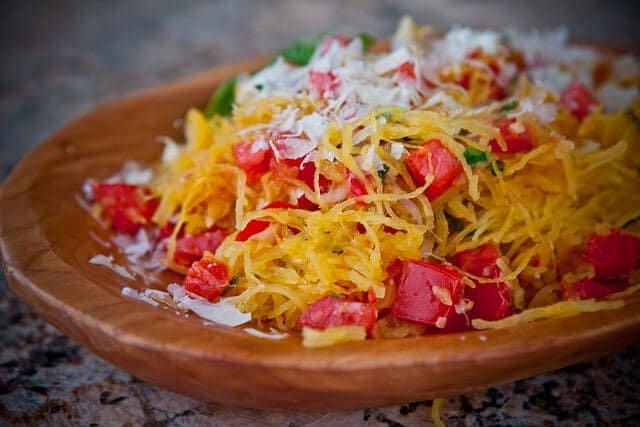 I love spaghetti squash- it really tastes just like spaghetti without all of the carbs! This looks delicious, Jaden! I love the glove recommendation, too. This morning I saw a commercial for the “Ov Glove”, which was basically a white version of your Pit Glove. I’m going with the Pit Glove! Oh sure…just rub your “fresh basil” in our noses:) Our basil died at the first or second freeze that we had. I haven’t tried spaghetti squash yet. I just got around to butternut squash last year and was surprised I liked it. 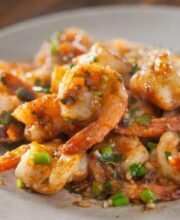 This easy but colorful and tasty dish could just be the trick for getting me to try the p’skedi. This sounds super tasty! 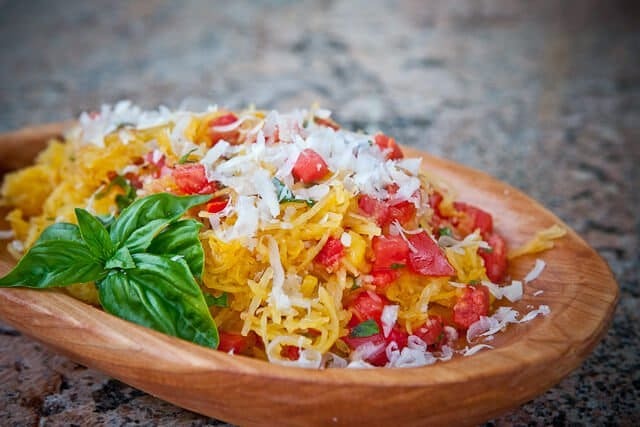 I love spaghetti squash and can’t wait to try this new way to make it. I haven’t had spagetti squash in years. Too bad our garden is pretty much done for this season but you can be sure that we will be getting some seed to plant next year. 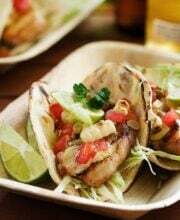 In the meantime will need to but some so we can try this as it has me soooooo hungry. I LOVE tomatoes and use them in numerous recipes but never thought to use them with spagetti squash. I love this combination with spaghetti squash! Wow this looks so incredibly tasty. 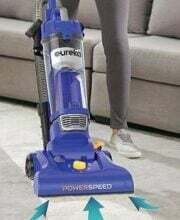 And easy, I love easy. I love meals that not only taste good but are pretty. This one definitely meets that criteria. I never even thought about microwaving squash. I am totally making this recipe tonight since I have a spaghetti squash sitting on my counter. Thanks. I have the same issue! Every time I’ve tried it, it’s been too crunchy. And bland. There’s got to be something to do with this squash other than pretend it’s actually spaghetti. Because it’s not. Oh yeah! 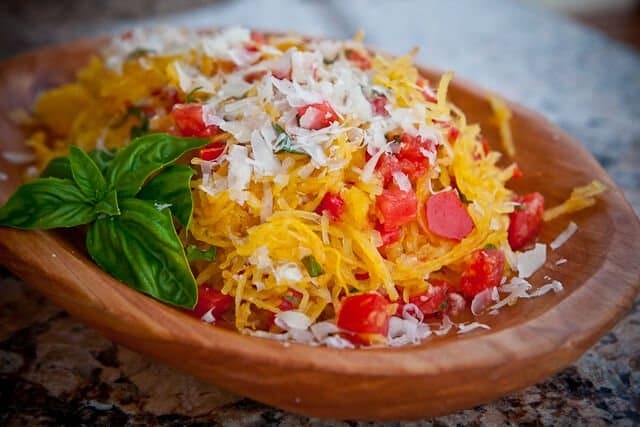 I’ve been looking for a good spaghetti squash recipe, this looks wonderful! 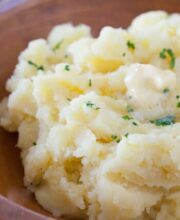 this is super easy to make! very pretty. 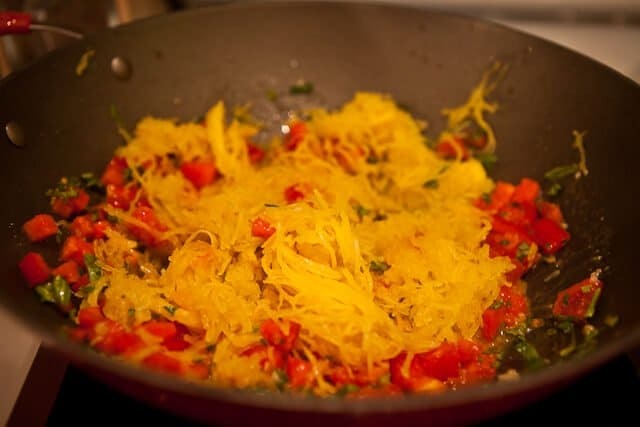 I love spaghetti squash… I just need to get my boys to like it, so I can justify making it more often! This looks like a possible winner for them! B) In LOVE with this. C) I want to wear it as a wig. 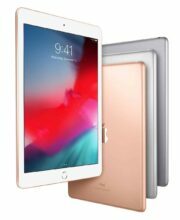 Ooh! This looks so delicious! I’ve always been intrigued by spaghetti squash but never cooked with it because I didn’t know what to do with it. This recipe looks delicious! Yum! Beautiful presentation and I love the little strands of squash, never tried cooking with spaghetti squash before.